That's right. I seriously dyed my hair bright pink. 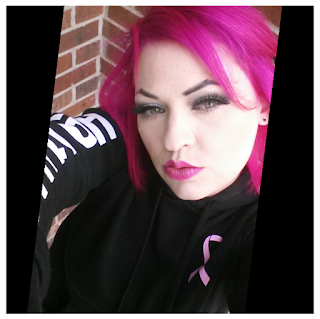 I've really wanted to do some funky colors in my hair for a long time now and with breast cancer awareness month here, I thought why the heck not. 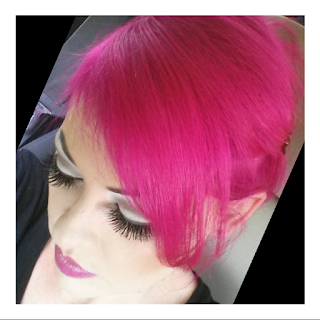 Usually, I get my hair done at the salon but I saw these cool rebellious color kits from Splat when I was at the store the other day so I thought I would try them out. I used to work as a color artist so I figured if I can do it a salon, I can do it with a box kit right? Sadly, I'm terrible at making "hair color" decisions and I'm just going to blame that on my extreme level of creativity. No, seriously. I really can't ever decide what I actually want. And then I get my hair done and I'm just like, "Meh..should've done something else." Literally every time. So, I thought these kits might be fun for me because then if I'm unhappy, I'll just add more funky colors right? 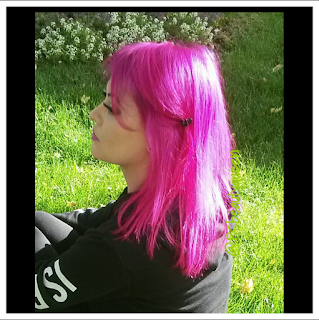 With the pink color I chose, I honestly wasn't sure how my locks were going to look after the coloring. But I decided to go for it. Yup. I chose the Pink Fetish color kit. It was the brightest pink I could find (even looking at other brands). This kit comes with everything you need to achieve your pink hair; bleach, peroxide and of course, the color. - Possibly a second Rebellious Color Kit - if your hair is thick or long. - A towel and a pillowcase you can ruin - your hair will bleed when it's wet/damp. Step 2: Wash out bleach and blow hair dry. Step 4: Wash out color and dry. Step 5: Style and look amazing! The process itself is pretty simple as you can see from the steps above. It is a little time consuming and depending on how long you will need to leave the bleach in, could take about 2-3 hours to complete. When using mixing the bleach, you will notice that the bleach is kind of a runny consistency. I've had literally never seen a bleach like that in my life so.. after seeing that, my insecure awkward self right away got worried but...I kept going, of course. I needed my pink hair. I'm not going to lie though being that runny, it was a little tricky to work with but I managed to get all of my hair covered thoroughly and my bleach blonde hair actually turned out perfect. My hair started as medium blonde ends with dark brown roots and turned a pale blonde in about 40 minutes. You may need to leave on more or less, depending on your starting color. Also, after you apply bleach, make sure to cover hair with a shower cap or plastic wrap. It does say this in the directions and is a super-important step in the bleaching process. So don't skip it. The color is extremely concentrated so you definitely want to wear gloves when applying the dye, rinsing the dye from your hair, and also when you dry it for the first time. Otherwise, you will have pretty pink hands, just like your hair. Before you apply color, make sure to spend a few minutes applying Vaseline to your forehead, your ears, and all around your hairline. This will make it less likely for you to dye your head and face, while dyeing your hair. 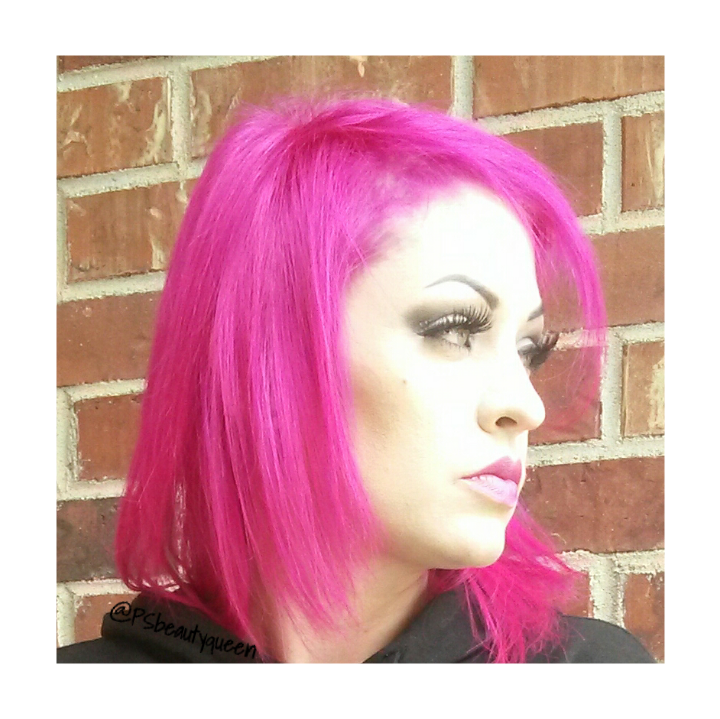 I'm absolutely in love with my new bright pink hair. I can honestly say that I don't think I've ever loved my hair color as much as I do right now. It is just sooo beautiful. And these awesome little hair color kits? They are way more awesome than I ever could've imagined. Like even if you've never dyed your hair, you could totally handle this ladies. 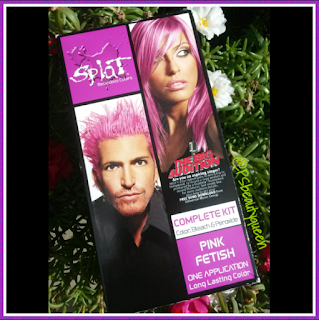 You can get Splat Rebellious Hair Color at Ulta and Walmart stores for around $10. They have more than 15 different colors to choose from. GO PINK for October. It will seriously make you happy every time you walk by a mirror. Disclosure: No samples were received for this post. All opinions belong to author.